BRM produced a short 12 pages document containing alterations to those 6063 pages long spec based on 2293+thousands of pages of comments from all countries+19 months of technical writing and global analysis work. By the way, those short 12 pages propose such nebulous alterations — as Resolution 25 on page 7 — that it is difficult to foretell how they will technically fit in the new specification. If applied, those alterations could turn the original spec upside down, so deeply that it could become a completely new specification, maybe even worse than the first one. 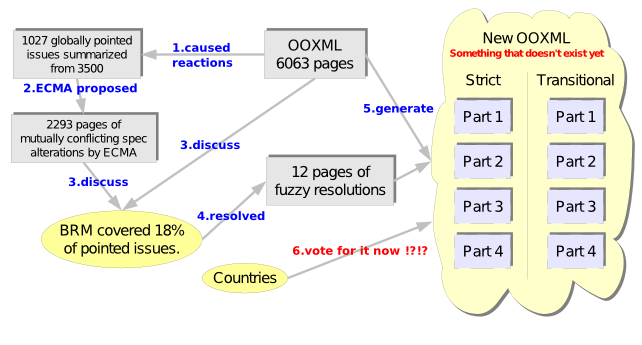 Now countries must vote if they approve or not this still unfinished new OOXML that will be divided in 4 independent parts for strict conformance class+4 parts for transitional (deprecated) conformance class. These final multipart wannabe standards don’t exist yet and will be released about the same day countries will have to vote for it. And you still think OOXML is ready to become an International Standard Format for storing YOUR documents ? Come on, give me a break !